today we wanna let you know why we have decided not to sell the brand new GoMaxGo-candy bars in our online shop. Everyone who wants to know why we do not like the genetic engineering, please have a look right here. We would be really glad, if GoMaxGo would take a closer look on their ingredients in the future, expecially regarding genetic engineering, fair trade labor conditions, and ecological aspects. We finally have all patches in stock again. Especially those we haven’t had for a while, like ‘Break Free’ and ‘The silence ends’. Printed by the Fairdruckt collective from Münster. Our sale is still on, and most of the stuff is already gone, but we still have a lot of Shirts from our older collections, like Make Hunting History, The true face of capitalism or End animal testing for only 12€. These are the last ones for sure! Every now and then we get a request from our customers to list more vegan shoes. There are quite a few companies now that produce under fair conditions and with recycled or organic materials. So, a good question! We’ve discussed this issue a few times in our plenary, but we’ve come to the conclusion that we don’t want to support any companies directly or indirectly that sell leather products. Someone might argue that the purchase of vegan products would increase the demand and thus increase the range of these products. That might be true, however the sales still support leather products indirectly, and thats something we don’t want to support at all. With Vegetarian Shoes we already have a cruelty-free company that might not always have the ‘latest styles’, but we are very satisfied with the quality of their shoes. So we’ll stick to the vegan companies, and hereby officially request all other companies to drop leather. Let us know your thoughts on the issue, we’d be happy to hear from you. If you already noticed the countdown in our shop – from February 15th we’ll start our Spring Sale. Maybe its a little early, but fingers crossed that it will help with an early beginning of spring! We have a lot of t-shirts, hooded sweatshirts and jackets, books, shoes and more. Single items, stuff with minor errors or old stock for really low prices. We’ve been looking for a vegan and ecological energy supplier for a while now, since our current suppier, Lichtblick also offers Ecogas, which is derived from manure from factory farms, something we don’t want to support. Most of the German eco energy suppliers already offer or are planning to offer Ecogas, so the only alternative is Greenpeace Energy. At the moment their energy mix consists of Water and Windpower, however they told us that they also might use Ecogas for energy production at some point in the future. So we’ve decided to go with Greenpeace Energy as they seem to be the best option for now. SMASH §278ff – Protest on Feb 27th in Vienna, Austria! On March 2nd the lawsuit against the 10 previously detained activists will start. The protest is the kick-off for further actions and protests around the lawsuit. No matter what the outcome of the lawsuit will be, as long as the §278ff exists, the threat remains that leftists structures, groups, NGO’s etc. will be monitored and criminalized. So come to the protest because we’re all in the same boat. We are all $278a! The trial against the 10 animal rights activists in Austria will start in March. You can show your solidarity with our new Benefit-Button. All the profits will be given to the donation account for legal assistance. Animal rights groups can order the button for a wholsale-price in quantities from 10 pieces on to use them for their solidarity actions.You can find all the dates for their court cases and further information here. Further there will be a Global Action Day Against Repression on March 3, 2010 because of the beginning of the lawsuit against the criminalized austrian animal rights activists to increase the public pressure on the austrian public authorities and to show solidarity with the prosecuted activists. There are going to be a lot of actions in front of austrian embassies, consulates and other institutions. Our Myspace-Page has been receiving a major update regarding design and like we already said in our blog, we will feed it with new information almost daily. Add us as a friend and let’s get started! Slowly but surely web2.0 has been arrived at the Roots-HQ. That’s what you have waited for a long time: You can now find us on Twitter. So, if you always wanna know what is going on in our office just follow our Tweet. We have new shipping times for parcels: They are gonna be picked up every day now – Monday through Friday. So, that means you will receive your order even faster! Apart from that we’ll expand our web 2.0 presence a little – you can now find us on twitter and it’s our plan to add more updates to our facebook and myspace pages. Over the holidays we’ll take things a little easier, but you can of course place your orders, and we’ll ship them around Dec 28th / 29th. For the new year we already have plenty of new plans and projects and products lined up so, expect to hear / read from us soon! We would like to tell you what was going on the last weekends, because we did all kinds of exciting stuff. At the end of August we attended the Animal Liberation Congress which took place at the Castle of Lohra. Besides many interesting panel discussions, workshops, food for thought, talks and lectures we met a lot of really nice people. There are plans to release a DVD with recorded talks and writings soon. We will keep you posted. One week later on September 6th we had a stall at the Vegan Festival in London. Unfortunately we can not give you a link for their website because of a Trojan Horse… you might just want to use a web search engine. The programme was very broad like last years and had a lot of intersting things to offer, e.g. workshops like: ‘Why should vegans and vegetarians be opposed to racism and fascism’ and ‘Veganism, Anarchism and Pacifism: Living compassionately’. Last weekend the Freie Schule Leipzig (Free School of Leipzig) organized a charity run that Roots of Compassion supported. The kids are collecting money to attend the IDEC (International Democratic Education Conference) in Israel in April 2010. That is our (silent) starting signal for another project of Roots: We want to criticize the school system. Soon you will be able to find literature to Democratic Schools and Unschooling in our shop. If you are interested already, check our link list here. Like you already know, we were at the Fluff Fest in the Czech Republic two weeks ago; except a journey of 8 hours (one-way!) and an endless struggle against wind and weather – our tent had no chance – we had lots of fun. The vegan burgers were delicious like always, but we were just too tired for karaoke and the dance hall – no surprise! Just the subsequent Saturday the 4th Veggie Street Day took place. You will find a detailed report, pictures and so on right here! Altogether 5.000 visitors came to the fair in Dortmund that day. Besides the Vegan Strength Team with Bodybuilding-World champion Alexander Dargatz and a terrific show of Kafkas, we saw willful polonaises through Burger King next door and last but not least Jana Wagenhuber who just escaped from Big-Brother-slammer. 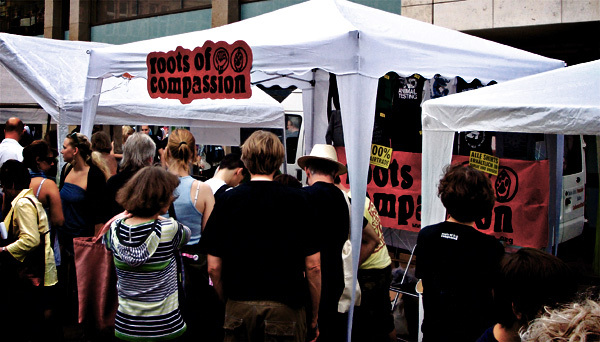 But there were lots of information about veganism and animal rights, vegan delights and, of course, the roots of compassion-stall. Furthermore we met a lot of nice people, among others members of the band Horns of Resistance from Wuppertal, Germany. Here you can find a few banners to insert into your website, profile, etc. We appreciate your support! Just copy the code from underneath the banner and paste it into the code of your website.